It's still a work in progress (as are we) but this is a new version of an old poster I made for the older children when they were about BigBoy's age to illustrate to them the three divisions of the Church. 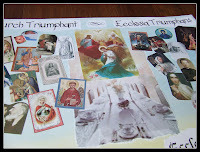 We chose our favorite saints, name saints and confirmation saints to represent the whole Church Triumphant. We also included these two littlest saints so dear to our hearts who we like to imagine as saintly playmates. 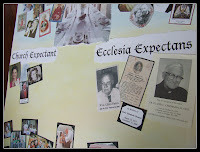 Next, we added pictures of our loved ones who have passed away to represent the Church Penitent or the Church Expectant. 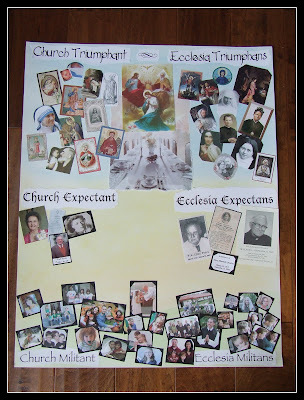 I chose "Expectant" over "Penitent" only because it sounded a little confusing to my children who know that we are penitent when we seek the sacrament of Confession. What a great idea. I love how it personalizes the ideas and makes them very concrete. My children are asking when we can make a poster like yours... I'm not sure when we'd find the time this month, but it would be so much fun!! This was pretty amazing! I'm with Jessica in thinking of a way to do one for our family. I've always heard the Church Expectant referred to as the Church Suffering. You are right, Margaret, that's how I have always heard it too, but when I was trying to find the Latin version for each, the only Latin phrases I found were Ecclesia Expectans, Ecclesia Penitens and Ecclesia Patiens. Since I wanted them both in English and in Latin, I went with Expectans since Penitens was confusing (as I explained) and Patiens, which is used as the Latin form of Church Suffering, is actually translated as patience and looks more like "patience" to a little guy's eye instead of "suffering". Confusing! I wanted to keep it simple and easy and it seems like this one division of the Church has many names. Suffering is also a difficult word to explain to young children. Yes, we suffer in Purgatory but it is not the same kind of suffering as in Hell. Suffering our purgation and shedding our impurities like silver in the fire is a completely lost idea on them at that age. Frankly, it also sounds scary. Even just talking about the fires of purgatory is hard for him to grasp. When he thinks of fires, he thinks of the Devil. 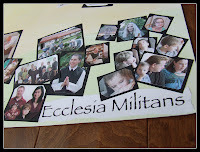 Anyway, thinking of the Church Suffering as Ecclesia Expectans helped my little guy to understand it better. We talked about the heart-ache of seeing Heaven but not being able to go there yet but at the same time, the hopefulness of those souls knowing that they will indeed someday get to be in Heaven, even if it takes a really long time as opposed to the utter hopelessness of those souls in Hell. It's just what works best for him right now. That is fabulous! 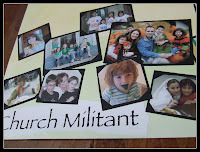 I love this idea and would love to do it with my kids.